New shop in Lerwick encourages people to make simple changes to their lifestyle. Becky Robertson (left) and Natasha Maltby of the Why Waste? Retail shop. SHETLAND’s shoreline is being bombarded with plastic waste and on almost every beach discarded items such as toothbrushes, shampoo bottles and plastic packaging are washed up, polluting the water with harmful micro plastic, entangling marine life and leaving an ugly eyesore on the local landscape, writes Alex Purbrick. Plastic waste is a global problem which appears almost impossible to solve but fortunately two Shetlanders, Natasha Maltby and Becky Robertson, are determined to create change in the way we use plastic on the isles by opening a pop-up shop called Why Waste? Retail in the Toll Clock shopping centre in Lerwick. Feeling disheartened from the images of plastic waste choking the oceans, Natasha realised she needed to change her lifestyle. As a mother and living on a restricted budget she described how she had “always been budget led, going to Tesco’s and buying the discount offers”. Refill station for household cleaning products. “I had not been eco aware but earlier this year we started Happy Eco People which is an online buy to order business enabling people to buy eco-friendly products, plastic free items with affordable prices,” she added. They have transformed the small retail unit in the Toll Clock into a space where people can be inspired to make small changes in their consumption of everyday household and toiletry products by switching to bamboo toothbrushes, stainless steel razors instead of plastic disposable and kitchen towels made from bamboo which can be washed and reused. 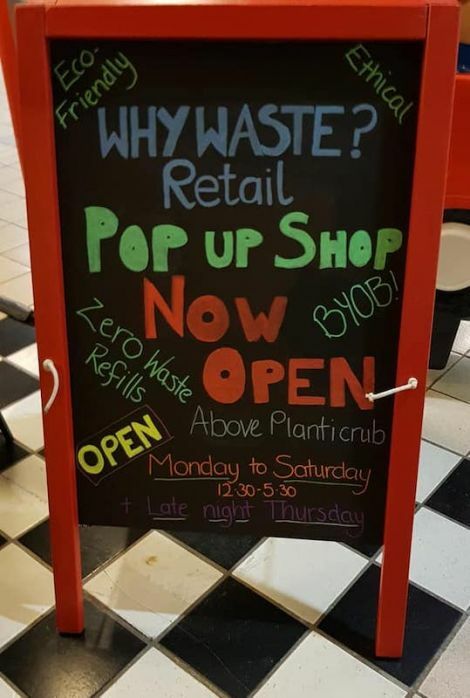 The aim of the shop is to encourage people to restrict the amount of waste generated from items they buy. Products like toilet paper made from bamboo and sugar cane which is wrapped in compostable biodegradable paper packaging and bamboo cleaning cloths that can be washed and once no longer usable, can be added to a compost bin. 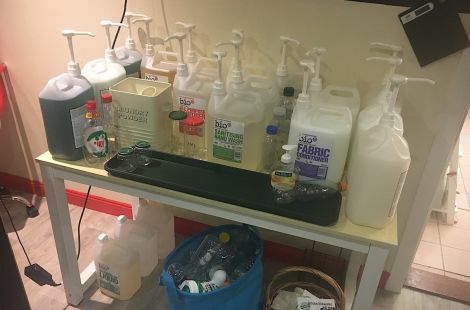 Within the shop is a refill station for Bio-D washing products which enables people to bring in their own containers for a refill on household cleaning commodities such as washing up liquid, hand soap, and fabric conditioner or use the bottles and jars available. Using the bottles and jars in the refill station also benefits the local community with all donations for use of these items going to the Gilbert Bain Endowment Fund to help the cost of paediatric training in emergency situations in Shetland. Why Waste? 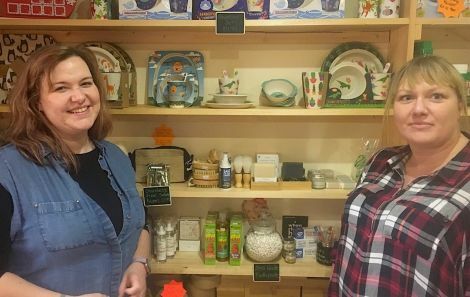 Retail might be a small step in tackling the plastic waste mountain but as Natasha emphasised, “it’s about promoting change and feeling good about what we’re doing”. “We’re trying to allow people to make small changes. If people can change their toothbrush from plastic to bamboo, then that’s a start,” she added. Why Waste? Retail is open Monday to Saturday 12.30pm-5pm above the Plantiecrub shop in the Toll Clock Shopping Centre until the 22 December with the possibility of continuing in the New Year.